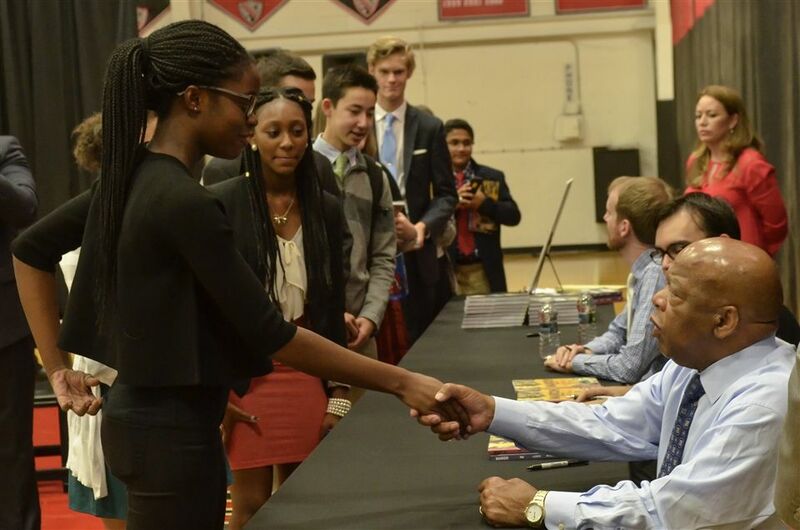 Civil rights leader Congressman John Lewis, co-author Andrew Aydin, and graphic artist Nate Powell – the creative team behind the March series of graphic novels – spoke to students, faculty, staff, and guests at The Hun School on Tuesday, October 6th. March is Congressman Lewis’ first-hand account of the civil rights movement and the landmark “Bloody Sunday” March in Selma, Alabama. Together, the creators of March discussed how chronicling John Lewis’s story became a graphic novel and a NY Times bestseller. Their visit coincided with the School’s inaugural Raider Reads Day. All Hun School students read March­: Book 1 and Book 2 over the summer. Raider Reads Day was organized by Laura Bishop, The Hun School’s library and media center director, as a culminating activity designed around that shared experience and the themes in the books. It included workshops led by twelve guest presenters from the academic community, seventeen members of The Hun School faculty, and seventeen student presenters. The authors, of course, provided the keynote address. Using the March books as an entry point into conversations and creative activities about social justice, equality, and activism, students participated in various workshops. During a variety of sessions, students made their own comic books, constructed live spontaneous performance art, and discussed gender and race issues. Others created stencil art and considered how words and imagery can be a powerful form of persuasive communication. And, taking inspiration from the creative work of the March team, students and leaders discussed how real change is possible.